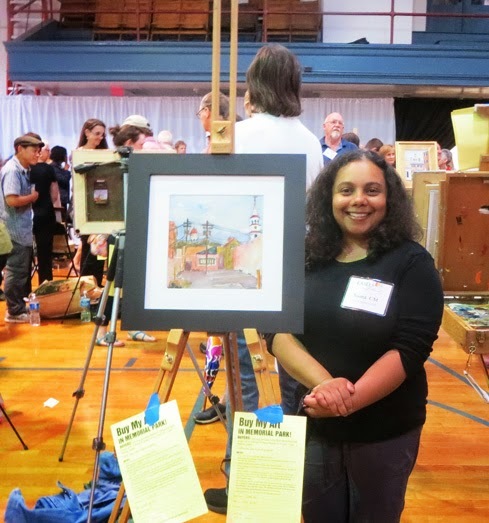 Drove down to Frederick, Maryland, Friday afternoon to participate in the Easels in Frederick Quick Draw competition -- a two-hour beat-the-clock on-location painting challenge at the end of the weeklong plein air festival. We stayed at the fabulously decorated 10 Clarke Place B&B, and strolled down to Volt for dinner - every bite was delightful. I scouted out locations for Saturday within the boundaries marked on the Quick Draw map, noting sheltered spots in case of rain. 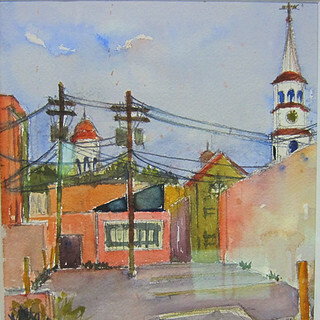 In the morning, the sky was indeed threatening, so I set up under the marquee at the Weinberg Center for the Arts and painted the alleyway just opposite, with the spire of Trinity Chapel in the background. When the start horn sounded at 9:30 I was pretty relaxed, but as the minutes ticked by I got more nervous -- at 11:15 I started getting ready to pack up, as I knew it would take some time to put everything away. At 11:30 it was brushes down! A few drops were falling so I held the paper upside down for the sprint to the car, parked in the garage a block away. In a few minutes the painting was signed, secured to the mat and framed. Just as I got ready to take down my easel, I had a buyer! Getting the receipt from the cashier was very exciting. M. and I celebrated with lunch at The Tasting Room before heading home. 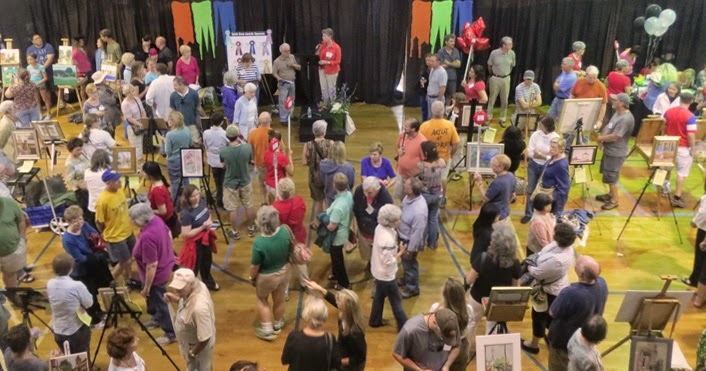 My next attempt at Quick Draw will be at Plein Air Easton, in Easton, Maryland, in a few weeks. Can't wait to see this town on the Chesapeake I've heard so much about. Cogratulations on the sale!!! Sounds like you had a wonderful time...and coming home with money is always nice.